Right, so Friday I wanted to get out and look at some waterfalls. The weather was quite lovely. Not too hot, sun was shining and there was a slight breeze. I printed out information on four waterfalls that seemed to be close to each other or within a short drive. We made some sandwiches, tossed in a few chips, veggies and watermelon. We took the back roads to the one major state road, where we could hook up with the next road to take us to the waterfalls. We drove about forty minutes and we were wondering where our next road would be come up. Hmm…. I kept looking at the print outs (notice, I did not say map-did not think of that) with the directions. Well, we see one road that will take us to two different ones that we were going try to hit later in the day. Ok, no big deal, we will just go a different way. We drive through the town and head up the mountain. We pass the Issaqueena Falls, we were thinking about stopping there for lunch but there was no way that was going to happen. A picture I snapped two years ago of the Issaqueena Falls. As it turns out, there is a ranger station about 3 minutes above the Issaqueena Falls, so we pulled in there to find out exactly where we were going. It turned out that we zipped past the road we were to turn down w-a-y back there for the first set of falls we could not find. The next set we were going to try to get to, well, they were another good twenty minutes away. With everyone getting really hungry, that was not going to happen. Checking out the map, we found that there was another set of falls across the road from the Issaquena. Sweet! We never knew and it stated easy walk. We have a new plan! Pile back into the car, head back down the road, turn into Yellow Park and turn off the car. Find cooler, remove lunch and eat it buy the side of a cute stream. Ahh… now this is more like it. 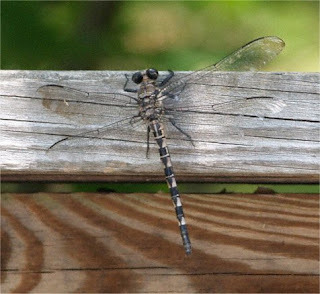 Check out the size of this dragon fly! Lunch was over about fifteen minutes later, we put all the stuff away and walk up to the sign to check out what is ahead of us. 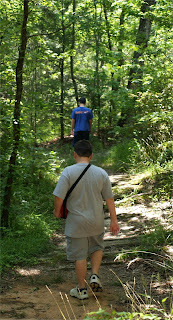 Ok.. so we notice that the walk states 1.5 miles, easy walk.. hum.. it is not too hot (yet) but it is sunny. Heck, we can do it. Notice on the right side that it points out we might see some various wild like, not a big deal. Snakes rank up there with spiders for me. Eeek! We have our water bottles, cameras and we are off! Not so bad as we head into the woods, we walk along a lovely stream and have to cross over a few cute little stone paths. 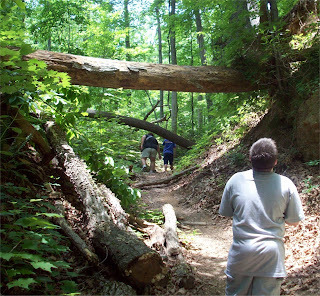 As we head deeper in, we begin walking over fallen trees, under fallen trees, watching out for roots, avoiding the poison ivy that is all over and making sure we follow the right path. Crossed the first bridge and walked on. We noticed some really funny looking mushrooms that were growing all over. Spencer kept saying that they looked like snowmen. Nate was the trailblazer (going full speed ahead) until he ran into a few too many spider webs. Then it was up to me to take over and lead the way. 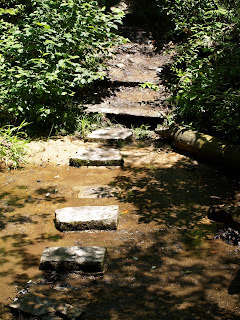 So, we crossed the next bridge, walked up a slight incline, shimmed (Nate’s words) around the edge of a steep drop off which also included stepping over a huge stump – remember this is an easy trial. Honestly, I don’t think I want to know what a difficult trail looks like. Then we hear this sound. It sounds like a deep growl; I can say it scared me to pieces. 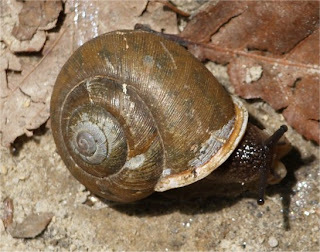 Then we hear it again, that is it, we are high tailing it back towards the car. We had gone so far, almost there in fact but nope 3 vs. 1, we are so out of there. Nate and I are practically speed walking, while Spencer and dh were pulling up the rear. The weather is now hot and humid, and we are all sweating like fools. We hear the sound one more time while walking back. Eep! When we reach the last bridge, Nate stops dead in his tracks. I could not figure out what was up. 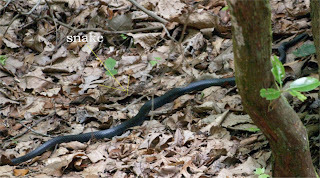 Remember in the beginning about the fact we might see a black snake on the trail. Um, right, Nate had spotted one heading into the stream. Then, we see the sign where we started a short time ago. The boys race to the sign where they pass a young couple heading in. Best of luck to them, we are so outta there. Reach the car; turn it on with the AC on full blast, relief! We are drenched, and then I notice that the thermostat in my car states 91 degrees. What in the world was I thinking?! "A moderately difficult out-and-back trail leads you to the base of a spectacular 50-foot vertical cascade. 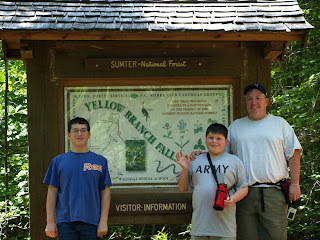 After a short hike on the Yellow Branch Nature Trail, you will come to the junction with the Yellow Branch Falls Trail. You will pass through groves of dignified hardwoods and cross meandering creek bottoms before turning to circumnavigate the steep terrain." I will be creating a new flickr badge with more pictures from the day .